First picture: Affidavit for U.S. Citizenship Application written for Gertrud Suse Khan (Susan Freudenthal) by her uncle Joe (Yosef) Freudenthal. Second picture: Affidavit for U.S. 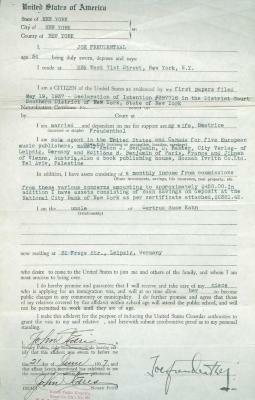 Citizenship Application written for Gertrud Suse Khan (Susan Freudenthal) by her granduncle Morris Friedman. From the personal collection of Susan Freudenthal, donated to the archives of The Center for Holocaust and Humanity Education.